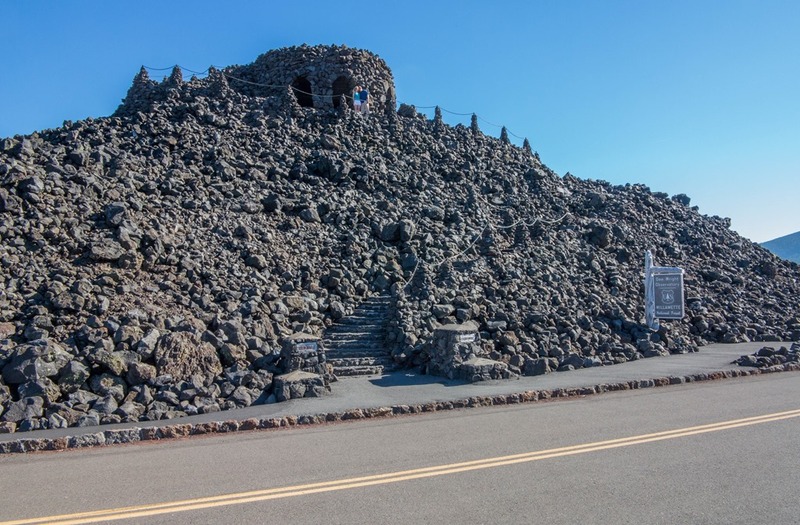 Heading east, the McKenzie Pass-Santiam Pass National Scenic Byway is an asphalt scar that wends its way over the Cascade Mountains and through the Willamette National Forest that surrounds a lava dome like male pattern baldness. Deep in the Cascade’s rain shadow, there are a few trees, isolated strays like the lonely strands my wife prunes quarterly, one by one, with scissors when doing my cranial yard work. As the landscape begins to flatten, I pass a sign pointing to a trailhead for the Pacific Crest Trail. Scanning the terrain to the limit of my head’s rotation, I strike this trail from my backpacking to-do list. Ahead is a conical bump in the lava field that flows to the horizon. As my approach brings its details into focus, it’s clearly manmade, and people are crossing the road from the parking lot and climbing to its summit on a spiraling stairway. Made of the same volcanic rock that surrounds me, this structure, in the middle of nowhere, was clearly created by the Civilian Conservation Corps during the Depression of the 1930s. Downshifting, I leaned into a parking space and eagerly dismounted. A brown US Forest Service sign proclaims that the Dee Wright Observatory is part of the Willamette National Forest. Mountains surround the empty terrain at almost every point on the compass by mountains; the absence of light pollution would reveal a celestial Milky Way majesty. And it would make riding at night a bit more interesting than I would prefer. Small openings dotted the interior’s circular walls at seemingly irregular intervals. 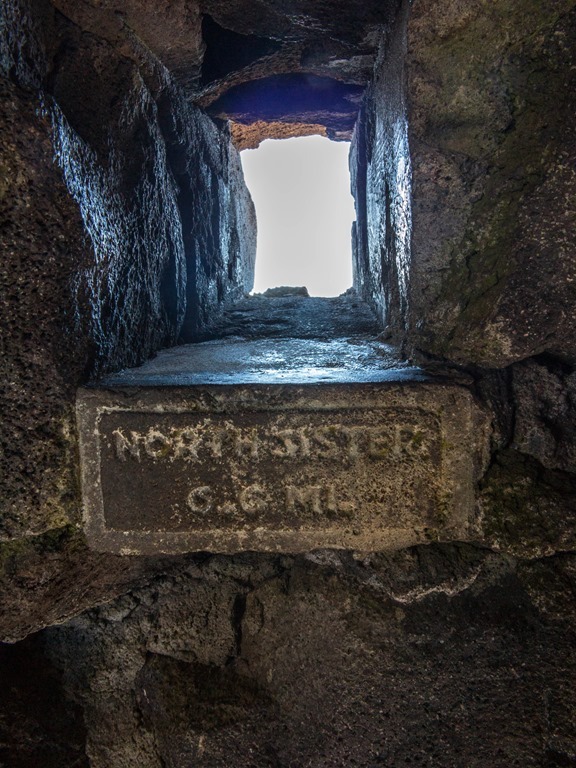 Crossing to the closest one, a carved stone said the opening framed the North Sister. Next to it were similar frames for the Middle and South Sisters. While the mountains remain unchanged in the observatory’s explanatory apertures, 15 miles west of the Sisters on State Route 242, all that remains of the glaciers is a small, snowy white yarmulke. After meeting the Three Sisters, I stepped up to each aperture for an introduction to Mount Washington and Mount Jefferson, and 78.5 miles to the north, the snow-capped Mount Hood. 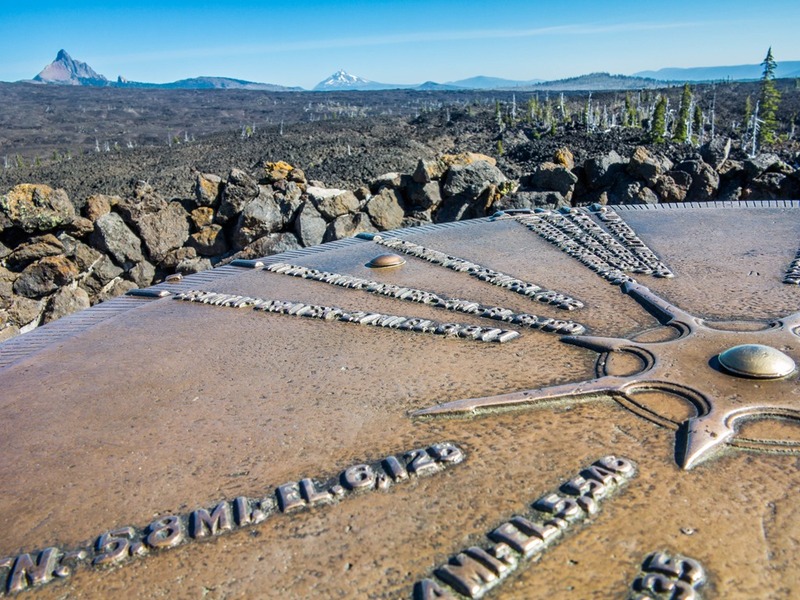 Coming full circle, the plaque taught me that the CCC built the observatory at the high point of the surrounding lava field that also provided the building materials. The corps completed the observatory in 1935 and named it in honor of the crew’s supervisor, who died the year before they completed it. Climbing to the observatory’s summit, like a button on a rocky ball cap, a brass compass card names the geographic features, gives their distances and elevations, and offers a relative bearing of sight. In addition to the mountains, it includes the Belknap Crater, the source of the lava that flowed forth 11,700 years ago. A shield volcano, the lava accumulated in a 65-square-mile sheet with a low profile, like Captain America’s shield, but without the patriotic decorations. Around me, couples and kids were in perpetual motion, pointing and sharing new knowledge. One youngster pointed her arm along the bearing to Three Fingered Jack; her companion wondered if there was a window for it below, and then they raced down the stairs to find the answer. If there were ever an award for a completely green, interactive exhibit that concisely conveyed information—and required exertion beyond pressing a button—Dee Wright and this Civilian Conservation Crew would surely win. Connected to the Internet at my overnight waypoint I tried, unsuccessfully, to learn the name of the observatory’s designer. But my search wasn’t fruitless. NASA trained Apollo astronauts at the lava field in 1964. And even though I was passing through in August, the scenic byway had just begun its 2016 season. Despite the Cascades rain shadow, the Oregon Department of Transportation often can’t clear the pass until the end of June. They close the route in early autumn, before the snow season begins. Scrolling through the day’s images, I remembered the feel of the cool air and sun’s warmth. The crystalline sky more clearly focused in memory the surrounding sights than any photograph could, regardless of its gigapixels. It was an encounter beyond the visual dynamic range. It was sensory imprinting, sight and sound and touch working in concert to build a memory far more durable than proposed by a high-def computer screen in a climate-controlled box. What began as a leg-stretching investigation of an unexpected structure offered the reward of discovery and introspection. This entry was posted in Civilian Conservation Corps, Motorcycle, Travel and tagged Interactive Exhibits, Observatory, Oregon, Scenic Byways. Bookmark the permalink. Our beautiful country is full of wonders! Thanks, Scott.